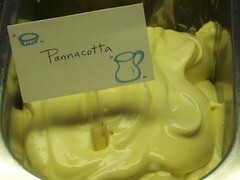 The newest gelato flavor at the caffe is Pannacotta. It’s oh so delicious! In case you’re wondering, Pannacotta means “baked cream.” Enough said.